This page is for the original release. For the Warmastered Edition, see Darksiders Warmastered Edition. Very few video customization settings. Bundled with Darksiders Warmastered Edition. All owners of any Steam copy of Darksiders will automatically see the Warmastered Edition as part of their library. Delete or rename AMD_Logo_movie.wmv, kaiko_logo.wmv, main_menu_intro.wmv, start_screen_intro.wmv, THQ_Logo1280x720.wmv, THQNORDIC_LOGO_Color_white.wmv and Vigil_Logo1280x720.wmv. Pre-rendered cutscenes are at 30 FPS. Frame rate is uncapped during the videos. Replace %LOCALAPPDATA%\Darksiders\options.dopt with the downloaded file. Open options.dopt with a hex editor such as HxD. Press Ctrl+G and go to offset 0x15 (hexadecimal). Type in 00, replacing the 01. 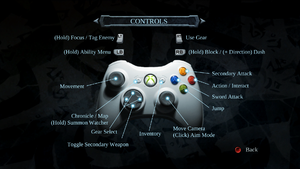 Keyboard and mouse controls are disabled if a controller is plugged in. XInput and DirectInput. Designed for XInput controllers. First/primary controller only. Renders most DirectInput controllers unuseable. Use XInput wrapper to bypass the issue. Separate for X- and Y-axis. DirectInput hotplugging crashes the game. 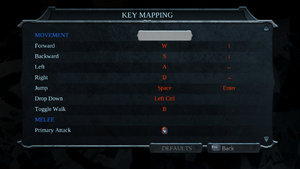 Global hotkeys (for example volume keys on some keyboards) are disabled when game is in focus. Sliders for music, sound, voice and videos. Auto-detection, 7.1 audio is supported. 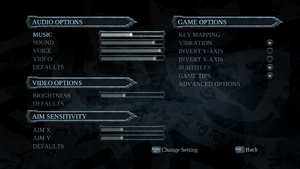 See also Helix Mod: Darksiders (new 2016 fix). Steam achievements will fail to unlock if the game has already been launched on the current instance of Steam. 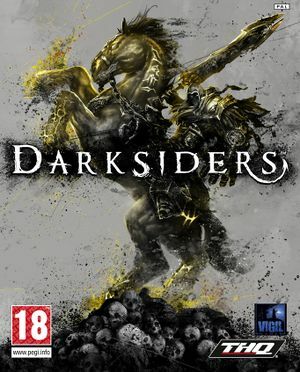 Restart Steam each time you launch Darksiders. Achievements that should have been awarded will not be awarded until the task is completed again. Check that Windows Media Player 11 or better is installed on your system. Codec Packs have been known to interfere as well (e.g. LAV Filters). Uninstall any codec packs. You may also try using the K-Lite Basic Codec Pack and concentrate every option into Windows Media Player, then use it's Codec Tweak Tools' Fix option. Could be caused by the AMD logo video. Rename <path-to-game>\media\videos\AMD_Logo_movie to something else. Unplug your keyboard, then start the game, then plug the keyboard back in. This is most likely caused by game detecting some of computers devices as controller. Push ⊞ Win+R and type joy.cpl then push OK.
From Advanced settings... set your used controller as primary one and then push OK. Locate all unused controllers listed and either unplug them physically, disable them from device manager or with virtual controllers uninstall from control panel. Extract the dinput8.dll into <path-to-game> alongside with DarksidersPC.exe. Launching game through exe may solve system reboot problems when game crashes. When playing on a system with multiple monitors, the game will default to fullscreen on the primary monitor. When the game is alt-tabbed out of and reopened, the screen will go black. Once there simply wiggle the mouse. Sometimes the game will go back to normal, and sometimes the game will crash instead. The game becomes very prone to crashing after Alt-Tabbing on some machines. Open the Start menu, search for Command Prompt and open it. Right-click and paste in the Command Prompt, then press ↵ Enter. Rename DarksidersPC.exe to anything else. Edit the shortcut properties to target the correct file. 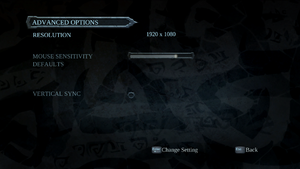 As the game doesn't feature many graphical options, for lower end machines, this disables most of the game's effects. Delete or rename all files including 'fx', except Impact_FX.oppc and vfx_shared.oppc. ↑ 1.0 1.1 File/folder structure within this directory reflects the path(s) listed for Windows and/or Steam game data (use Wine regedit to access Windows registry paths). Games with Steam Cloud support may store data in ~/.steam/steam/userdata/<user-id>/50620/ in addition to or instead of this directory. The app ID (50620) may differ in some cases. Treat backslashes as forward slashes. See the glossary page for details. This page was last edited on 8 April 2019, at 09:36.